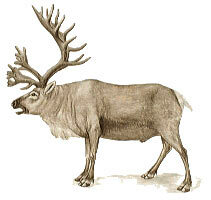 Once divided into several species, all caribou and reindeer, including the domesticated reindeer, are now considered races of a single species. The races vary in coloration from almost black to brown, gray and almost white. The caribou is the only deer in which both sexes have antlers, although those of the female are smaller.The antlers are unique in that the lowest, forward-pointing tine is itself branched. Females are gregarious and gather in herds with their young, but adult males are often solitary. In autumn, males fight to gather harems of 5 to 40 or so females. The female produces 1, occasionally 2, young after a gestation of about 240 days. Young caribou are able to run with the herd within a few hours of birth. Some populations migrate hundreds of miles between their breeding grounds on the tundra and winter feeding grounds farther south. Grass and other tundra plants are their main food in summer, but in winter caribou feed mainly on lichens, scraping away the snow with their hoofs to expose the plants.